Airbnb, the startup darling and innovator of the peer-to-peer home vacation market, has a history of legal trouble. It all started last year, when a handful of horror stories went viral. Users said they’d had their homes trashed and defiled, information stolen, and complained that Airbnb’s response was less than satisfactory. But the company stepped up to the plate, issuing a mea culpa heard ‘round the Internet, and increasing security controls. Airbnb also recently introduced its $1 million insurance guarantee, a reassuring effort for all of the renters out there nervous about the threat of damages. Destroyed homes aside, there are a couple of much bigger problems looming in the shadows for Airbnb – and they start with your landlord and continue on to zoning laws. A recent story from a power Airbnb host detailed how his landlord served him papers for renting out his rented apartment using the site. This got me thinking about the one and only reason I’ve never signed up to be an Airbnb host. I’ve rented rooms, homes, and even a tugboat-turned-houseboat with the help of the site, with generally very positive experiences. And given that I travel fairly often and live in downtown Portland, Oregon, I’ve considered clicking the site’s prompt to list my apartment several times. What always stopped me is the fact that I don’t own my apartment, and I never could quite believe that it was legal for me to make money off a place that my landlord owns. Alright, so basically what Airbnb is saying is we have this platform, do with it what you will. The marketplace, that’s on us. The activity you create on it, that’s on you. There are plenty of property owners using the site to rent out their places. The problem is that, in most cases, renters using the site to host people are breaking their rental agreements. Real estate attorney Joshua Price tells me that the majority of leases have a clause prohibiting subletting – which is, essentially, what Airbnb facilitates – without a landlord’s consent. There are exceptions to this rule, and he mentions that in New York there is a statute giving renters a loophole around such clauses. Airbnb says there are currently no numbers on how many hosts rent or own their properties on the site. While many renters using Airbnb might be operating outside the law, this is hardly something the Airbnb platform is responsible for. Check any Craigslists apartment and housing section and you’re sure to find a number of people trying to find subletters. The reasons are many: college kids who are going home for the summer and don’t want to fork over the rent while their apartments sit empty (which I’ve done); anyone who decided to fill up that extra room with a new roommate but was too lazy to add them to the lease (also, see me in college); frequent travelers who for some reason like to keep an apartment for the brief intervals between their vacations (unfortunately not me). The difference is that Craigslist, if you want it to be, is anonymous. You don’t even have to provide your own contact information or any photos, if you really don’t want to. Yes, it’s entirely possible that if your landlord happened upon your post seeking a subletter (the more information you provide, the more likely this is), you could find yourself in hot water. But compared to the plethora of info Airbnb requires from its hosts, Craigslist is a veritable wasteland. Not only are you encouraged to add as many high-res photos as possible (or take advantage of the professional photography Airbnb can supply), but for safety reasons you need to identify yourself. Which makes total sense: Every time I’ve used Airbnb, I’ve done a decent amount of research on my hosts, making sure I wasn’t going to become a cautionary tale. Airbnb wants to help its hosts advertise well and make them money, and you can’t fault the company for that. And for all of the property owners using the platform, that’s great – but renters are just giving visibility to their illegal activity. Don’t think your landlord knows about Airbnb? I’d think again: The site has blown up over the last year. It’s not highly likely you’ll get caught, but every day you’re taking a greater risk as the site’s popularity grows. I asked my own landlord what she thought of Airbnb – she loves it and uses it to find vacation rentals all the time. She also tells me, however, that she rents out properties in three different states and all of her contracts contain no subletting agreements. Landlords are going to (and are beginning to) grow wise to this game and start checking the site for their own properties. And that’s where you can get in trouble. There are two questions we need to ask here, one of them being more of a stretch than the other. 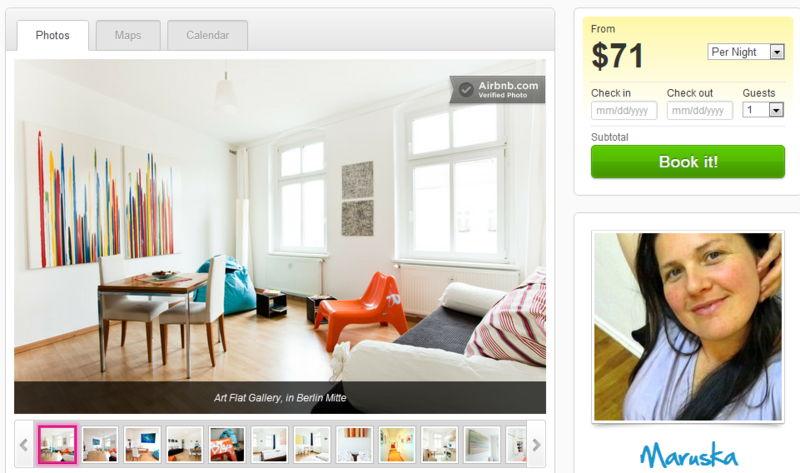 First: Is Airbnb acting as an enabler in all this? The site has provided a platform allowing us to monetize the space we (to varying degrees) live in without putting any language front and center about the fact that we might be breaking the law. Of course, that isn’t Airbnb’s fault exactly. If you choose to rent out your extra bedroom, your landlord sees it, and you get yours, then according to the terms of service, that’s your problem. And there are plenty of online platforms that could be used to break the law. As long as that’s not their intended use, though, it will come back to the user every time. Still, I find it rather alarming that any notice about your contract with your landlord is buried in the terms of service. Would it kill Airbnb to have a prompt when you try to list your unit, asking what your ownership situation is? The site already has a few available checks and balances front and center, but none of them refer to this specific question. It’s really easy to blame Airbnb in all this. But that’s analogous to blaming torrent sites for piracy, even though many also host plenty of legal activity. Which raises the second, bigger question: Because it provides the marketplace, is Airbnb responsible for what users are doing there?